Chevrolet's '19 Volt is to start arriving in dealerships at the end of the month. 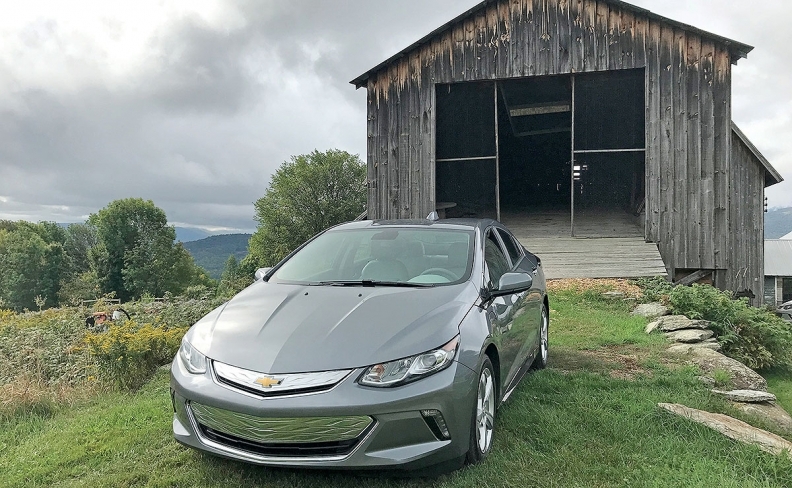 BURLINGTON, Vt. — The Chevrolet Volt has always been a different kind of car — from its styling to its industry-first powertrain. And now it will sound different, too. The 2019 Volt — beginning to arrive at dealerships at the end of the month — features a new General Motors external safety system that emits a whooshing white noise, with volume increasing as the vehicle accelerates. The sound is meant to signal the vehicle's presence to visually impaired people or pedestrians and bicyclists who aren't paying attention. The system is designed to meet coming safety regulations for hybrid and electric vehicles, whose motors make much less noise than internal combustion engines. For nearly a decade, U.S. regulators have been assessing rules regarding the noise electrified vehicles should make. The guidelines, first demanded by Congress in 2010, were finalized by the U.S. Department of Transportation in February. The rules give automakers about a year from now to add the sounds to at least 50 percent of their new "quiet cars" when they are moving at up to 18.6 mph, according to Reuters. The requirement hits all new quiet cars a year later. Drivers and passengers of the 2019 Volt shouldn't notice the sound unless they're listening for it. "We put a lot of work into making sure it was quiet on the inside of the car," Rob Mantinan, Volt program engineering manager, told Automotive News last week during a media drive here. The system on the freshened Volt is the third iteration of safety systems, which started on the first-gen Volt in 2010. That car included a pedestrian-alert horn button that the driver had to press. The second-generation Volt — introduced in 2015 — had a one-speaker system that emitted a high-pitched buzzing sound. The full- electric Bolt EV has the same system, but is expected to adopt the new system in coming years. "The new one is more tonal. It's more deliberate. It's more noticeable, for sure, on the outside of the car," Mantinan said. It works with two small speakers in the front and rear fascias that are linked to a module that senses speed and shifter position. The speakers automatically play the sound when the vehicle is in drive or reverse at low speeds. As the speed increases, the sound becomes louder. "It's supposed to be an audible cue that the vehicle is accelerating," said Mantinan, who started working on the Volt program a decade ago. GM believes its system will meet the federal standards, but testing procedures haven't been finalized. If it's not compliant, Mantinan said, GM believes that could be solved with a software change. NHTSA, according to Reuters, has said the rules will cost the auto industry about $40 million annually because carmakers will need to add an external waterproof speaker to comply. But the societal benefits of the reduced injuries are estimated at $250 million to $320 million a year. Other changes for the 2019 Volt include an improved infotainment system with an 8-inch touch screen, new settings that enable the vehicle to capture more regenerative energy and an optional 7.2-kilowatt charging system that reduces the charging time to 2.3 hours from roughly 4.5 hours with a 240-volt outlet. The new battery system will be a $750 option on the LT trim and standard on Premier. The 2019 Volt LT will start at $34,395, a $300 increase from the 2018 model. The Premier will start at $38,995, a $550 increase. Pricing includes shipping.